movement for adult education including a correspondence course known as the Chautauqua Literary and Scientific Circle. The focus at this time was to bring values of higher education to the middle class in mostly rural areas. The meetings brought thousands of people together for these educational events and also allowed them to enjoy concerts and social activities. By the latter part of the 19th century, the Chautauqua Institution became nationally known and was considered a center for rather earnest, but high-minded, activities that aimed at intellectual and moral self-improvement and civic involvement. The Chautauqua Movement, which was obviously influenced by the Chautauqua Institution, developed from the Chautauqua Literary and Science Circle. This movement was most popular in the Midwest region of the country, but had member Chautauquas in over 30 states. There were more than 150 independent Chautauquas across the country as well. Many of these communities started to develop permanent building structures dedicated to the focus of the Chautauqua Movement. Shelbyville, Illinois is arguably one of the most important cities of this era in that it had two Chautauquas. 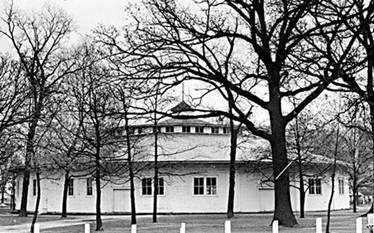 The Lithia Spring Chautauqua, located east of the city, was established in 1891 by Jasper Lewis Douthit, a Unitarian Minister. This Chautauqua was very popular for many years until the start of its decline around the turn of the century. The Shelbyville Chautauqua Association was established in 1901. In 1902, the newly formed association voted to build a permanent structure just as some of the other communities that hosted Chautauquas had done. 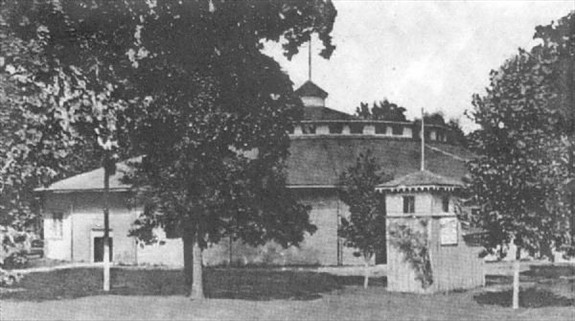 This Chautauqua Auditorium was to be based on a similar structure that had been built in Dixon, Illinois and designed by Architect Morrison H. Vail. designed and constructed by local bridge builder H.B. Trout, with a unique system of structural supports, radiating out like spokes in a bicycle wheel. Because of this design, there are no interior pillars to block the view of the stage. The project took eight months to build at a cost of approximately $7,500. The Shelbyville Chautauqua was one of many independent Chautauquas across the country. It has been a stop for many famous speakers including William Jennings Bryan, President William H. Taft, Reverend Sam Jones, Billy Sunday, and Carrie A. Nation, making the Chautauqua Auditorium unchallenged as the center for entertainment and culture for Shelbyville and its surrounding communities.